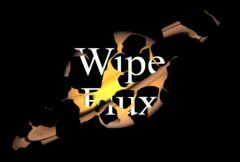 Performs a wipe transition between two input clips using a flux texture with mostly round cells. The Wipe Amt parameter should be animated to control the transition speed. Increase the Grad Add parameter to make the timing of the flux pattern move across the screen during the wipe. Increase the Border Width parameter to draw a border at the wipe transition edges. Bubble Smooth: Default: 0.25, Range: 0.008 or greater. Rotate Warp Dir: Default: 0, Range: 0 or greater.